adapters with respect to the gun's axis. These locations are possible because the bearing retainers can be mounted to the housing in increments of 60 degrees. The adapters reduce the amount of recoil and counter-recoil forces transmitted to the supporting structure when the weapon is fired. Firing contact assembly. The firing contact assembly is mounted to the housing so that the connector is outside the housing, and the spring-loaded cam is inside the assembly. The contact assembly provides the necessary path for the current to enter the housing and reach the breech-bolt assembly. This path goes through the connector to the conductor, to the insulated insert in the contact cam assembly, and then to the breech-bolt assembly. Clearing solenoid assembly. The clearing solenoid assembly is mounted near the back of the gun housing. It is linked to and controls the movement of the clearing sector assembly. Clearing sector assembly. The clearing sector assembly is linked to and controlled by the clearing solenoid assembly. When the solenoid is activated, the sector arm diverts the bolt assemblies into the clearing cam path. Guide bar. The guide bar is located on the gun housing. It guides the rounds into and out of the extractor lip that is located on each of the six breech-bolt assemblies. Breech-bolt assembly. 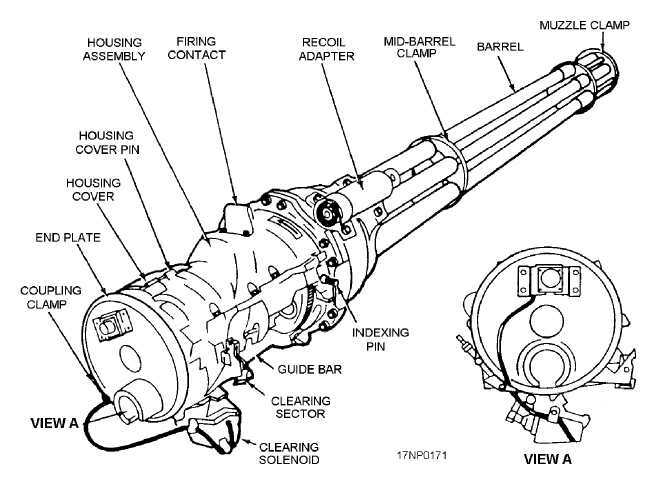 The breech-bolt assembly picks up a round as it enters the gun, transports it to the firing chamber, locks it into the firing position, transmits the firing voltage to the primer of the round, and returns the empty case to the guide bar, where it is cammed out of the gun. An extractor lip on the front of each bolt assembly engages the rim of a round throughout these actions. There are six breech-bolt assemblies in the gun. Guide slots or grooves on the side of the bolt body permit it to slide on the rotor tracks. The bolt roller shaft determines the position of the bolt as it follows the main cam path or the clearing cam path in the housing. 6-3 Figure 6-3.Gun component locations.